While the newly formed team under coach Christian Titz plays the club’s first ever season in Bundesliga 2, I will take a step (and look) back in quite an unusual way. Firstly, Markus Gisdol hasn’t been Hamburg’s coach since January. Secondly, one rarely finds actual analysis on what happens in training – mostly due to lack of footage. In Germany it’s normal for clubs to have a lot of public training sessions, although I can’t personally attend many sessions of a single club throughout a longer time period. Whenever you get insights from inside an organization, on the other hand, you have to keep those secret in respect to the club that offered this opportunity. Thanks to German HSV fan blog “Rautenperle.tv”, there’s a lot of video clips available on Markus Gisdol’s time in Hamburg, though. They liberally allowed me to use it for this analysis which I can’t thank Markus Scholz and his team enough for. Of course, this article will be about critically evaluating Markus Gisdol’s work but it’s also about how professional coaches structure their training sessions, which ideas are actually behind what they do and what the execution of it looks like. You can also use the following explanations as kind of a drill collection. But throughout the article it should become clear that this is quite a useless thing to do in regard to your own work as a coach. Instead of looking at single training sessions in isolation, I have divided different training exercises by their type. The structure of the paragraphs is based on when you would do a certain drill within a session but also on their complexity. Needless to say, that there will always be some overlaps using this approach. At the beginning of the warm-up, Hamburg’s players usually go through different stages of athletic exercises which included elements of coordination, acceleration etcetera. This could be done in combination with ball work. Alternatively, the ball would only be introduced at a later stage within the context of unopposed (passing) drills. The use of these exercises isn’t to be neglected within the boundaries of this article. But it’s more of a problem that unopposed work is either non-specific or highly specific in relation to how a team wants to play. This makes it really hard evaluating this type of training exercises when you only have short video sequences of it at your disposal. At the same time, it should be noted that these drills don’t incorporate certain elements that make football what it is in the first place: time, space and opponent as constraining factors. Apart from the very first part of warm-up, Markus Gisdol includes these elements at least partly in all of his other drills. There are few doubts about him being what most people would call a “modern coach” in regards to the methodology used. In this aspect, you can also see what influenced him as a coach throughout his career – namely Ralf Rangnick and his “pressing school” which dominated at TSG Hoffenheim throughout many years and continues to do so more or less at all Red Bull clubs. It’s no coincidence that Hamburg’s sporting director Bernhard Peters, former head coach of Germany’s field hockey team, worked together with both Gisdol and Rangnick at Hoffenheim. Gisdol himself served as an assistant coach under Rangnick at Schalke as well. One surprising observation can directly be related to that: Markus Gisdol (almost) never uses the typical “rondo” as part of his warm-up. Rangnick once called the drill „Gammel-Ecke”, which can be translated to something like “lazy corner”. FC Barcelona once made this simplest form of a keep away game popular in its methodical use. You can play it in all possible numerical relations from 3v1 over 5v2 or 8v2 up to something like 15v3. If one of the defenders touches the ball or another player passes it out of bounds, one of the defenders switches with whoever is responsible for the unsuccessful action. With only one defender, there’s not too much difficulty in setting this up. With two defenders it’s usually about who played in the middle for the longest time. With three defenders it’s a good option to let the responsible player and the two people next to him go in the middle. Ideally many areas that are specifically related and important for football get activated with this type of exercise: quick touches of the ball (restriction to one or two touches or other variations like: after somebody plays with two touches, you have to play with one touch), constant adjustment of the body position, attacking the ball and covering when defending. If nothing else, this type of warm-up exercise is adored by many players and it’s easy for coaches to make it a competition or to add further rules. Normally, the defenders have to stay in for an extra round for every 10 to 15 passes or when one of them receives a nutmeg. Alternatively, small physical punishments like push-ups are also used. Diego Simeone set up a triangular goal in the middle of the playing area using poles. If the players in possession pass through it, this results in an immediate extra round or a different kind of punishment for the defenders. Therefore, they are forced to keep the center closed at all times. But they can’t allow themselves to be passive as the passes are still counted by the other players. With a good use of your cover shadow, you will be able to both cover the middle of the field and press the ball at the same time. On a group tactical level, it means that one defender always has to cover if the other one attacks the ball. He also has to read the body position of the opponents in order to anticipate the next pass and find a good moment to step forward himself. Recently, Marco Silva divided the players into pairs of two: If your partner commits an error, both of you have to go in the middle. These are only two examples to show how many possibilities there are to adjust a simple rondo to your own needs. For many coaches it seems to be more than just playing “piggy in the middle”. The main idea remains to keep the ball for as long as possible. A certain number of passes is rewarded with points. To increase the chance of being successful with this, the team in possession has to create a structure that gives the player on the ball as many options as possible. Thus, triangles and diamonds are of high importance here. On a level of detail, (pre-)orientation and body position are also very important, but you can focus on pressing as well. Due to the defending team being outnumbered, there’s little point in playing man-to-man – the opponent would always have at least 3 free options. Instead, it would be useful to defend in a rather space- and option-oriented manner and staying compact, especially in central areas. In the next step, you can guide the opponent towards certain areas of the field to aggressively put pressure on the ball in those areas. The same thing should always happen after losing the ball – you can heavily focus on the first reaction in counterpressing. As the spaces are often tight, there are usually a lot of small transition moments in which you can develop the collective “instinct” (Jürgen Klopp) of winning the ball back as quickly as possible and using the resulting open spaces right away to play away from pressure. Markus Gisdol, for example used more players in such a positional game – one on each side of a rectangle and one in the middle. Numerically, keeping the ball should become easier while pressing should be more difficult. After losing the ball in the center of the playing area it’s of high importance to close the passing lines towards the neutral players, especially those on the sides, while still putting immediate pressure on the ball. If you look at it closely, however, the effect of adding additional players on a space that is tight anyway will not necessarily help your possession game. It might be even more likely that the players in the center of the field almost run into each other while blocking passing lines towards the neutrals on the outside. Confusion and chaos whilst looking for those neutrals only as an escape route without further tactical or strategical thoughts behind it are likely outcomes of this. In the context of Gisdol’s game idea at least creating chaotic situations seems to be a desirable effect of such an exercise and shouldn’t be judged negatively right away, although there are certainly other ways of designing a drill for that outcome. You can have setups with a lot of turnovers and transition moments which still allow to have a more structured possession game in the occasional organized moments. Interesting variations of the same exercise would for example include rules like prohibiting a pass from one neutral to another. But positional games are not always and necessarily about connecting as many passes as possible and about relentlessly chasing the ball for the sake of just having it. Without playing direction one can lose sight of what is actually the context of the game. That’s why usually different ways of scoring are introduced even within the basic forms of positional games. In the typical 4 versus 4 plus 3, for example, it’s quite common to reward playing from the neutral on one end to the one on the other end with an extra point. That way, you’ve created an ever-changing playing direction without even using (mini) goals. Those can be introduced in a next step and are often used for the defending team – it can counter right away which in turn affects or triggers the counterpressing of the possession team after losing the ball. Of course, you can also introduce rules for the possession team that allow them to score in one of the goals. They accomplish a pre-defined task, e.g. playing in/through certain zones or again achieving a certain number of passes, and are rewarded with the possibility of finishing. If you are strict about the distinction, this exercise isn’t really a positional game anymore but rather a normal game form in a tight space. But it’s used for a similar purpose like positional games at the beginning of a training session. The drill was originally used by Diego Simeone with who Markus Gisdol actually had an internship before joining HSV. The playing area is divided into four vertical lanes and two halves horizontally. At each end, there are two mini goals, exactly between one of the central lanes and one of the wing lanes. The possession team keeps the ball with four players in their own half while four players of the opponent are positioned in the other half. These players can block passing lines but not step over the halfway line. In the final zone, there are two more players of the possession team, right in front of the two mini goals. The same is the case the other way around which makes it a 6 versus 6 overall. The possession team tries to connect with one of their two target players on the ground who plays a lay-off to his partner in order to score in any of the two mini goals. Everybody bar the target players must stay in their lane. The drill mainly teaches basic concepts of ball-oriented pressing, namely shifting and covering for each other. The player in the lane with the ball moves forward to block an immediate pass forward. The other three players cover behind him (buzz word: „defensive triangle”). On one hand, you train the fundamental mechanism of pressing and dropping in relation to the ball. On the other hand, it’s about having proper orientation when you are not the one directly involved in pressing the ball as it’s your responsibility to screen passes towards the target players. Without checking the shoulder yourself or communicating with the team mates, collective defending will be impossible not only in this drill, but football in general. The transitional character of a positional game can be further increased by dividing the playing area into different fields or zones with only one being active at a time while the other one is more or less a free space. Adding to the usual rules for aspects like number of passes, one team or both teams now try to dynamically enter this unused zone as the opposing team looks to prevent just that. Markus Gisdol used the most typical variation of this positional game type. You divide two teams of equal numbers and mark out two fields right next to each other which have the exact same dimensions. In one of the fields, one team starts in possession of the ball and tries to keep the ball for as long as possible. In the video example, the drill is played in a 6 versus 3. If the three defenders win the ball, they try to connect with their three team mates who positioned themselves within the other field. If this is successful, a new 6 versus 3 is created. The team that defended before now tries to keep the ball. Important coaching aspects for this positional game are again related to counterpressing in the 6 versus 3. Ball losses must be anticipated early based on local numerical relations as well as the body positions of team mates. If one of them is in one corner of the field with the back turned towards the middle I should already come slightly inside as it’s not extremely likely for him to secure possession of the ball. It’s of highest importance to cover the center (which means in this case: the border between both fields) as the ball winning team can only play through this area in order to connect with their team mates. Once you actually win the ball, it’s important to look deep right away. The three players in the other field need to be well staggered, shouldn’t come too close and have to constantly adjust their positions as they look to make the best use possible of the free space around them. After a turnover and a successful switch to the other field, the previous possession team has to react quickly as the first sprint is especially important. If there’s a seamless transition, the ball can be pressured right away and the opponent can’t establish possession and numerical superiority in the first place. For a few moments, you can ideally create a 3 versus 3 instead of a 6 versus 3. Gisdol further increased the transitional character of this drill by allowing the ball winning team to actually have a counter attack including finishing. In this variation, the three players in the unused field can immediately attack on a big goal which is closer to where they are originally positioned. The ball losing team can still press once the ball is played away from pressure but due to their starting position they have a clear disadvantage. Good counterpressing becomes even more important to prevent a situation like this in the first place. Additionally, one of the coaches can also serve balls to the free players immediately after a ball goes out of bounds. All players have to be in a constant state of transition. At the same time, you train finishing under pressure as well as preventing scoring in the last possible moment after your (counter-)pressing was beaten. In regards to the positional games it can be said that they were mainly used for providing situations in tight spaces while incorporating the constant possibility of transition moments which usually leads to a number of chaotic situations. Organized moments were most likely to happen in pressing. Structure in possession seemed to be more of a side effect. These aspects fit well with the placement of positional games within the sessions. Coaches that favor controlling the game (through possession) like to enhance this type of drill for the main part and use players according to their positions on the field (that’s also where the name “positional game” originates from). That way, they work on the structure of their team in possession whilst also working on their game principles. Almost needless to say, Markus Gisdol also has game principles. But they are mostly related to other aspects of the game. Accordingly, his base is a different one, too. The 1 versus 1 is often referred to as the „base of football”. A simple idea behind that: If you win your direct duels, you will also win the game. Of course, this is a vast simplification and speaks of a somewhat outdated football understanding from a time when man-marking represented the standard. The wise Ernst Happel, one of Hamburg’s most successful coaches of all time, already knew: “If you play man-marking, you have eleven donkeys on the field”. Nowadays most coaches use different tactical tools to create numerical superiority close to the ball in pressing as well as in possession. With this, you don’t rely on winning your individual duels as much, but this obviously doesn’t mean that 1 versus 1 situations don’t or shouldn’t exist anymore and that you don’t have to train related scenarios in training. Especially in the context of fundamental training, you can teach children and teenagers a lot of different movements using 1 versus 1 scenarios. On a professional level it’s more about evaluating in which situations a 1 versus 1 is most likely and desirable to occur which also depends on how a certain team wants to play. In a system that is based on dominance in possession, e.g. in the case of Pep Guardiola, you might overload one side of the field to isolate the winger, e.g. Leroy Sané, on the far side. Like that, you give certain player types a desirable 1 versus 1 situation that they are more likely to succeed in based on their individual superiority. Despite that, it’s generally important that 1 versus 1 situations usually occur only for a short time. They probably last the longest when defending on the wing. But even then, as the full-back you will usually have the rest of the back 4 and at least one central midfielder covering behind you. Once your 1 versus 1 ends, additional players are ready to support even when it’s not a clear 2 versus 1. Defending inside your own penalty area, on the other hand, is often more clearly man-oriented in order to have immediate access to the opponent and being able to block shots from short distance. But even here, it’s key to observe how the play developed before that – communication with team mates about players in the back, where the opponent is likely to have or already had their breakthrough, possibility of an immediate shot for the player on the ball after winning a previous duel etc. Transition moments might be closest to how a 1 versus 1 duel is most often defined, particularly after rather chaotic actions that can’t be covered collectively immediately or when you have to save what can be saved. For a playing style, that wants to use such moments in a more or less strategical way, it makes some sense to train the 1 versus 1 once in a while and to refresh certain desired behaviors. Markus Gisdol used special situations to simulate 1 versus 1 situations in a more game realistic manner without using two players who would just start from a static position and run towards each other. For the dynamic of the game, it’s of course useful to have a certain tempo in a 1 versus 1 but also positions that players are more likely to be in during an 11 versus 11. Gisdol let the players run through a short area before the actual action started. On the wing this would lead to a situation where the defender actually starts inside of the attacker who receives the ball out wide with the advantage of being a few steps ahead. The defender now has to close the route towards goal, meaning he has to catch up first and then to react to the different possible movements of the attacker. In the center, on the other hand, the attacker dribbles through a shorter area and ends up alone in front of the keeper. The defender comes around a second later and has to prevent him from scoring, either by winning the ball or at least by disturbing the shooting routine. A variation of this is to again start three different (running) duels at the same time but to only pass one ball to one of the wingers. As such, a 3 versus 3 is created overall but due to the starting position and orientation it rather resembles a situation of a 3*(1 versus 1). Again, the defenders are slightly behind and have to make up for this disadvantage. This is relevant for all situations where the opponent successfully plays in behind the back line and attacks the space with runners. As the drill goes on, it also challenges the defending inside the own box and once again is about finishing under pressure. The next step would be to play in a 2 versus 2 from the start. This is mostly done in a small space, using two keepers and big goals. This is again relevant for defending inside the own box. Due to the close proximity to the defenders goal, you always have to put pressure on the ball and on both opposing players while still being able to intercept passes or block shots. Transition moments are usually added to the procedure in order to create a dynamic and to provoke quick reactions at all times. Start in a usual 2 versus 2. If the attacking team doesn’t score and the ball goes out of bounds, two new players start with a ball from the other goal. The two players who failed to finish immediately become defenders. If the attacking team scores, two new players start from their side and play against the same two defenders. You constantly have to be able to react to previous situations in this exercise. Quick transitions are a must. To work on specific moments that look to be created as often as possible in the game, the number of players gradually increases with the attackers being in numerical superiority. The defenders are often trained rather implicitly based on how the drills are mostly set up but the focus can also be shifted easily. At the same time the spaces in which the drills are executed become more game realistic. In the case of Markus Gisdol that mostly means: Playing through wing areas, followed by movement in the center to finish on goal. That’s something you can definitely describe as a special feature. A lot of time is used to work on specific and precise wing patterns in the final third in which generally includes opponents. For this often a particular form of training was used in different variations. A field that includes the area of two penalty boxes and one short area in between them is marked out. Amidst the middle zone, there’s one of the coaches, ready to serve the balls. Both sided, a dummy/mannequin is positioned on the outside of the same zone. The group is divided into two teams. Each team has two defenders in their own penalty area and one striker in the opposite box. At the same time, both teams have at least one player who is initially positioned wider than the dummy/mannequin. More players keep themselves ready behind the goals or outside the playing area ready to allow constant changes. The game starts with a pass from the coach towards one of the center back pairings. The opposing striker stays passive. The ball is played outside where one of the wingers from the same teams receives the ball behind the dummy and takes a touch past it. At the same time, the striker and the ball far winger start their runs in the center. The player on the ball either dribbles inside in order to score by himself or to assist one of his team mates. An often-used pattern saw the striker attacking the space in front of the first post, running behind the near center back. With the right timing he could either receive the ball by himself and finish or at least create space for a cutback to the far winger. Of course, other variations are possible here and usually discussed with the players prior to the execution to not interrupt the flow of the exercise. If one of the defenders wins the ball it continues right away as they pass outside to one of their own wingers in order to start a 3 versus 2 in the opposite penalty area. One specific adaptation with a slightly different setup is only played on one side. Two dummies are put just outside both penalty areas. There are two attackers and two defenders in each of those. One team constantly attacks through their left side, the other one through the right. This can easily be related to which side the respective players would usually be lined up during the actual game. In this variation the winger takes his touch even more towards the center as there’s almost no space to play in between center back and keeper. As a general principle in such situations is to find space in behind the defender, the location of this space changes based on the pitch setup. In this case, the area just at the edge of the box can be used for cutbacks. For example, one attacker makes a run between both defenders while the other one drops back centrally. Alternatively, another typical movement can be executed as well: The far striker runs towards the near post, the near striker towards the far post. Another option is to deliver high crosses for these types of movements and to basically solve a 2 versus 2 in the opponent’s box. Like many other coaches, Markus Gisdol divides the field into five different lanes: center, two wing areas and two half-spaces. These markings can be seen clearly in many of the clips. The game outside of the center is mainly emphasized within arrangement. Interactions in wide areas ideally create options to play into the half-space. The half-space simply has the advantage that it’s closer to the goal and offers more options for follow-up actions. A pass back outside is possible while the same goes for playing towards the center. Deliveries inside the box from the half-space are generally more dangerous as they travel for a shorter time compared to crosses from the wing. This also makes flat crosses a much more viable option as they resemble normal passes much more when played from the half-space. On the wing, however, you are basically forced to pass in a certain direction as the field is restricted by the sideline if you try to go the other way. 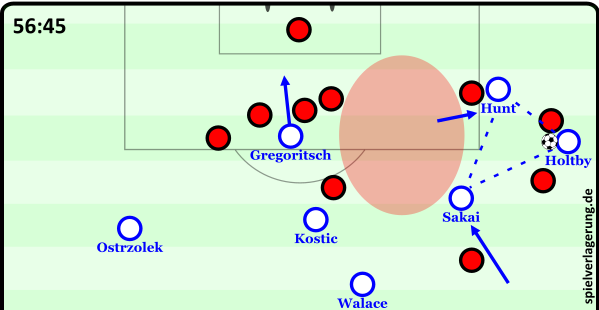 That’s how Hamburg scored the 2:1 versus Freiburg in February 2017 (click on picture for analysis in German). You can clearly see how patterns can be used during the game to open up the half-space inside the penalty area. The ball always starts with one of the full-backs or wingers in the half-space. The other wide player positions himself wider and receives the first pass. Together, both of them try to combine forward between two dummies (e.g. opposing winger and central midfielder). This zone is guarded by one of the coaches in a rather passive manner. Once they go past him, the central attacking midfielder as well as the striker enter the play. In a group of four, the attackers try to find a way to score versus two defenders (e.g. full-back and center back). For this they can use the patterns that were already applied in drill 6. Compared to that exercise, in this one the interaction between full-back and winger is added though. Without good cooperation between them, a successful attack remains impossible. Them solving a 2 versus 1 is in fact a trigger for a second situation to start or for the same situation to be enhanced. The passively defending coach should be changed with an active defender at some point. Another step is to start the exercise with a passing pattern in the center of the field to trigger a pass towards wide areas. Afterwards, the attackers would play through to goal using pre-determined patterns while clearly outnumbering the defending team (second part of the video).